One day when Abraham was very old he called his most trusted servant to him. He told him to go and find a wife for Isaac, the son born to Abraham and Sarah in their old age. 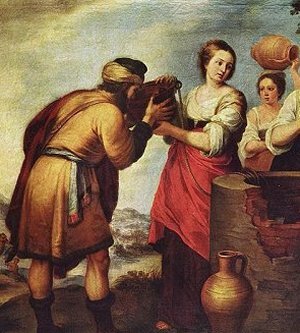 He didn't want Isaac to marry one of the women of Canaan, so he sent the servant back to his own country and family to find a suitable wife. "What if she won't come with me?" said the servant. Abraham said if that happened then the servant would be released from his oath. The servant went on his way back to the city of Nahor. He had ten camels bearing gifts for the woman and her family. He came to a well and had his camels kneel down. Several young women were there drawing water. How was he going to know which woman was the chosen one? 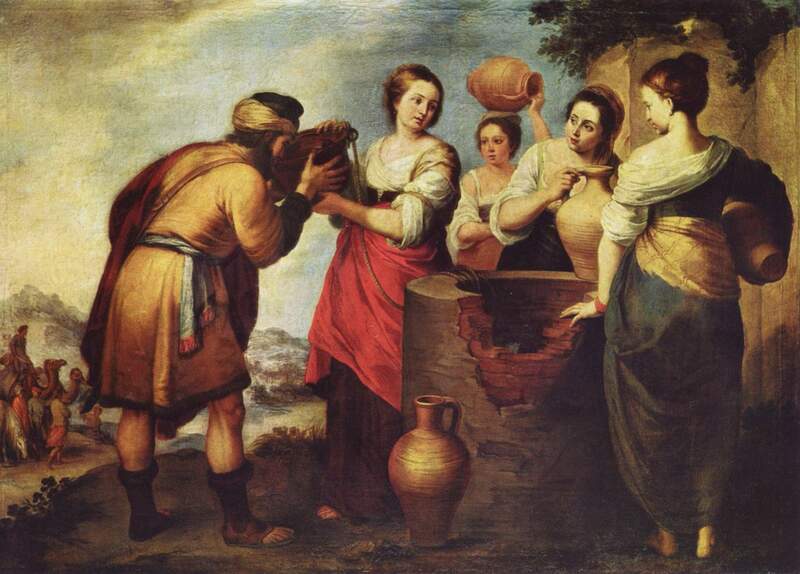 He began to pray to God, "Now let it be that the young woman to whom I say, 'Please let down your pitcher that I may drink,' and she says, 'Drink, and I will also give your camels a drink' let her be the one You have appointed for Your servant Isaac." Even while he was speaking a beautiful young woman came to him. He asked her for a drink and she let her pitcher down from her shoulder to her hand and gave him a drink. Then she offered to give his camels a drink also! It was just as the servant had prayed. He gave her a golden nose ring and two golden bracelets. He learned she was one of Abraham's relatives. He knew she was the one for Isaac. God had answered his prayer. A camel can drink a lot of water, maybe as much as a large barrel would hold, and the servant had ten camels with him. This was no small task for Rebekah to carry enough water to water all his camels. Imagine how much water it would take to fill 10 big barrels! She was truly a remarkable woman to make such an offer. After she watered the camels she ran home. 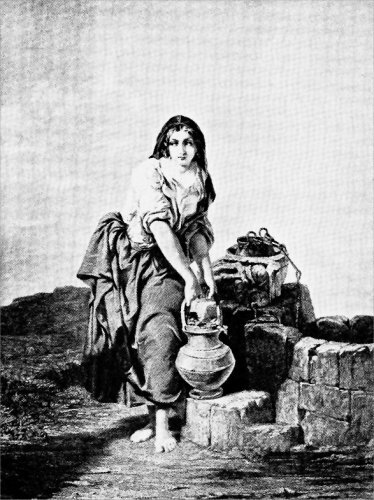 Her brother Laban saw the gold ring and bracelets and went to the well and brought the man home with him. The servant was anxious to tell the reason for his coming. He retold the whole story and Rebekah's family believed the Lord's hand was in it. They consented to let Rebekah go back to Canaan with him. He gave Rebekah more gold and silver jewelry and clothing. He gave rich gifts to her family. They wanted Rebekah to stay at home for another ten days before leaving, but the servant wanted for them to be on their way. They called Rebekah and asked her about it and she said she would go with him. 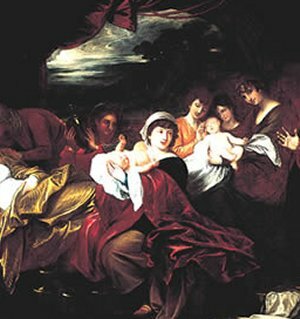 They sent her nurse and her maids with her and they traveled far away to Isaac's home. As they got nearer she saw a man walking in the field. She got down from her camel, covered her face with a veil and went to meet her husband. Isaac loved her very much. At one time there was a famine in the land and Isaac moved and went to Abimelech the king of the Philistines to live in his land. Rebekah was very beautiful and Isaac was afraid someone would kill him to get his wife, so he said, "She is my sister". Does that sound familiar? Years before his father Abraham had told Abimelech the same lie about his wife Sarah. Abimelech was upset when he learned the truth, and told the people of the country that no one was to bother Rebekah. Rebekah and Isaac had been married twenty years and they still had no children, then she was able to have a child. And not just one child, but two. She had twins. The first son born was covered with hair and they called him Esau which means "hairy". The second one born was named Jacob meaning "supplanter" or one who takes the place of another by scheming. Even though Esau was born first, Jacob would be the leader in the family. Years later we will see Rebekah's role in getting Jacob named as the leader in the family. 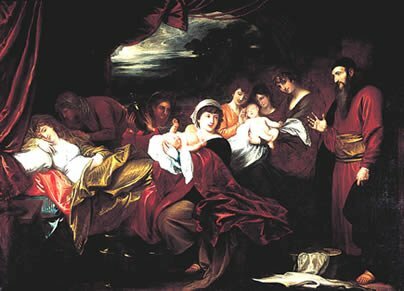 Jacob, with his mother's help, tricked his father Isaac into giving the blessing for the first born to him instead of Esau. Jacob was Rebekah's favorite son. She wanted him to get the best of everything and God had told her that the older son would serve the younger. As a result of the trickery and deceit Jacob had to leave home to escape his brother's wrath. Rebekah sent him away to her brother Laban and she never saw him again. We do not know when Rebekah died, but we do know she was buried in the cave of Machpelah in the field Abraham had bought for a burial place for Sarah. Deceit is a terrible thing and causes a lot of heartache. In Rebekah's family it caused Esau to hate his brother. It tore the family apart. Because of Rebekah's action in getting Jacob to lie to his father, their son was lost to them and they never saw him again. Always tell the truth. God will be pleased and your parents will trust you. English Bible Activities Select story #21 in the list for activities to accompany this Bible story. Spanish Bible Activities Select story #21 in the list for activities to accompany this Bible story. Press "Go" to search for books about Rebekah. This is a great page to find the type of things that I need and use for my Wednesday night children's program. I am in charge of the Bible Story time and you all have great material. Thanks so much! This page displayed 82,693 times.